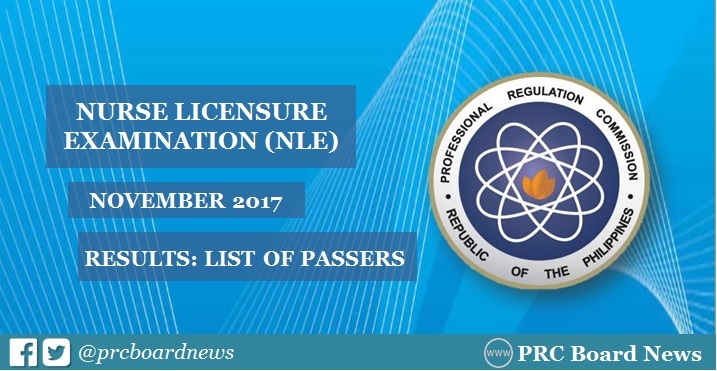 MANILA, Philippines – (Updated December 12) The Professional Regulation Commission (PRC) and the Board of Nursing (BoN) released results of November 2017 nurse licensure examination (NLE) or nursing board exam on December 12, or in eleven (11) working days after the exam. The official list of passers, top 10 (topnotchers), top performing schools and performance of schools are available on this page as announced online. UPDATE: 5,875 out of 12,869 passed the exams. PRC administered the nursing board exam on Saturday and Sunday, November 25 and 26, in Manila, all regional offices nationwide (Baguio, Cagayan De Oro, Cebu, Davao, Iloilo, Legazpi, Lucena, Pagadian, Tacloban, Tuguegarao) and Zamboanga. The members of the Board of Nursing who gave the licensure examination are Carmelita C. Divinagracia, Officer-In-Charge; Gloria B. Arcos, Carfredda P. Dumlao, Glenda S. Arquiza, Florence C. Cawaon and Cora A. Añonuevo, Members. From January 3 to 9, 2018, registration for the issuance of Professional Identification Card (ID) and Certificate of Registration will be done online. Please go to www.prc.gov.ph and follow instructions for initial registration. The November 2017 nursing board exam has drawn basic knowledge, skills and attitudes in the major subject areas i.e. Fundamentals of Nursing including Professional Adjustments, Maternal and Child Nursing, Community Health and Communicable Disease Nursing, Nursing of Adolescents, adults and aged and Mental Health and Psychiatric Nursing. According to PRC Resolution No. 2016-1019 and Pursuant to Section 7 (d) of R.A. No. 8981, the target release of NLE results is on Friday, December 15, 2017 or in fourteen (14) working days after the exam. In the November 2016 exam, NLE results were released in twelve (12) working days after the exam. PRC named 6,836 out of 14,322 who have passed the exams. University of Santo Tomas (UST) and Benguet State University - La Trinidad topped the schools with 100% passing rate. Southern Luzon State University (SLSU) - Lucban and Saint Louis University (SLU) were among the top performing schools. SLU graduate Eric Carolino Jacinto and UST's Faith Calzado Rutagines aced the board with identical average grade of 86.60%. In the November 2015 exams, results were announced online in twenty-four (24) working days. A total of 9,114 out of 18,500 passed the tests. UST, Mariano Marcos State University (MMSU) - Batac and Xavier University got 100% passing rate. Alyssa Claire Anguren Almo from Remedios T. Romualdez Foundation, Suha Canlas Hassan Magdy Mohammed Ibrahim of Pamantasan ng Lungsod ng Maynila (PLM) and Alyssa May Bringas Madriaga from UST topped the board with 86.40%. PRC Board News expects release of NLE results between December 11 (Monday) and December 20 (Wednesday) or in 10-17 working days after the exams. PRC Board News will update this page once we got reliable information from our sources. For the previous board exams, takers can expect exact release date of results by always visiting this site. PRC is expected to release results on earlier date as the total number of takers is fewer compared to previous examinations. Note that the number of takers equates to the total number of days of checking the results. December 1, 2017 Update: Reliable source for the release of NLE results, Dr. Carl Balita shared his riddle for the most probable date of judgement day for recent NLE takers. "When the identical sum up to two and the number of sunrises align anew, the privilege to care shall be revealed in view...then the DREAM and the DREAMER is ONE in you." December 12, 2017 Update: NLE results are expected to be released on December 13-15. Good luck to all takers! December 12, 2017 Second Update: NLE results are out online! Sana makapasa kapatid ko. This week na po ba ang NLE results? kELAN po release ng results PRC? Good luck po sa lahat! Malapit na! Babagsak talaga ate mo, In Jesus name kasi. Dapat In Yahshua's name. Jesus is not the true name of our messiah. It is Yahshua.